Tree populations at the rear edge of species distribution are sensitive to climate stress and drought. However, growth responses of these tree populations to those stressors may vary along climatic gradients. 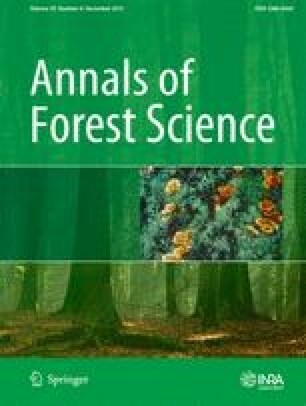 To analyze growth responses to climate and drought using dendrochronology in rear-edge Pinus nigra populations located along an aridity gradient. Tree-ring width chronologies were built for the twentieth century and related to monthly climatic variables, a drought index (Standardized Precipitation–Evapotranspiration Index), and two atmospheric circulation patterns (North Atlantic and Western Mediterranean Oscillations). Growth was enhanced by wet and cold previous autumns and warm late winters before tree-ring formation. The influence of the previous year conditions on growth increased during the past century. Growth was significantly related to North Atlantic and Western Mediterranean Oscillations in two out of five sites. The strongest responses of growth to the drought index were observed in the most xeric sites. Dry conditions before tree-ring formation constrain growth in rear-edge P. nigra populations. The comparisons of climate-growth responses along aridity gradients allow characterizing the sensitivity of relict stands to climate warming. Contribution of the co-authors JJC contributed new methods or models, analyzed data, and wrote the paper; RDM conceived the study, performed research, analyzed data, and contributed new methods or models, wrote the paper; RSS conceived the study, analyzed data, performed research, and wrote the paper; RMNC conceived the study, analyzed data, performed research, and wrote the paper. The online version of this article (doi: 10.1007/s13595-013-0321-9) contains supplementary material, which is available to authorized users. This project was funded through a Junta de Andalucía and projects DIVERBOS (CGL2011-30285-C02-02) and XILVA (CGL2011-26654), through the Ministry of Science and Innovation of Spain. RSS acknowledges a FPU grant (AP2007-04747) (Science Ministry, Spain), also the financial support from CEXTREME-FP7-ENV-2008-1-226701 and INIA-RTA (RTA2010-00065-00-00) projects. We also acknowledge the financial support from University of Córdoba-Campus de Excelencia ceiA3 and CRU and S.M. Vicente-Serrano for providing meteorological and drought data. JJC thanks the support of ARAID and collaborative efforts within the Globimed network (www.globimed.net). We thank the editors and reviewers for improving the manuscript.